Safety regulators say BMW's repair procedures should prevent loss of power steering. December 12, 2018 — A BMW X5 xDrive35d investigation has been closed after federal safety investigators found BMW's plans to fix the vehicles should be enough to correct any safety risks. The National Highway Traffic Safety Administration (NHTSA) opened the investigation in April after BMW X5 xDrive35d drivers reported idler pulley bolt problems. BMW had recalled about 30,000 xDrive35d vehicles in 2012 because customers lost power steering when the idler pulley bolts broke. 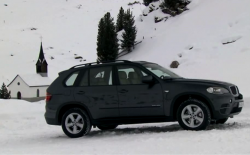 The 2009-2013 X5 xDrive35d vehicles have pulleys that use bolts to secure the alternators to the engines, but BMW determined various problems could cause the bolts to loosen and break. Drivers suddenly faced a loss of power steering while driving, a dangerous condition especially if the vehicles are moving at slow speeds or around curves. BMW told dealers to fix the problems by installing new bolts with new installation methods, but owners continued to complain about belt drives failing, alternator problems and a loss of power steering. In May 2018, BMW notified NHTSA about a recall that would occur because of reports of power steering loss in 2009-2013 X5 xDrive35d vehicles. The recall affected more than 33,200 vehicles as an expansion of the 2012 recall. But at the time, BMW said a remedy was still being worked on. NHTSA investigators found evidence that forces on the bolt could cause the bolt to loosen over time, causing additional bending stress on the top of the bolt. The combined stress is enough to cause a bolt to break and cause a sudden loss of power steering. Safety regulators analyzed customer complaints sent to NHTSA and BMW and found 93 complaints alleging the idler pulley bolts failed after the vehicles were repaired during the 2012 recall. NHTSA says it is closing the BMW xDrive35d investigation based on the automaker creating a new idler pulley fastening system for the vehicles.